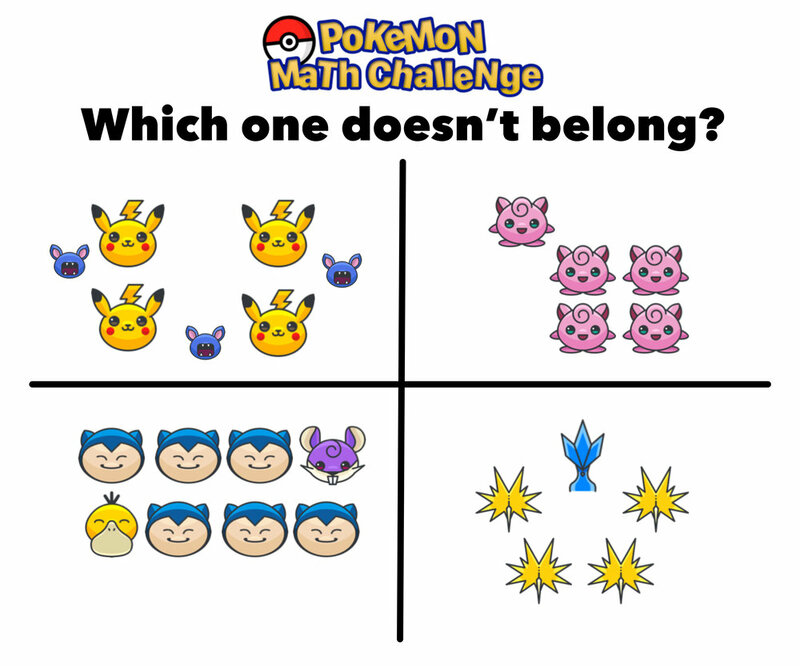 Have You Seen These Free Pokémon Math Puzzles? 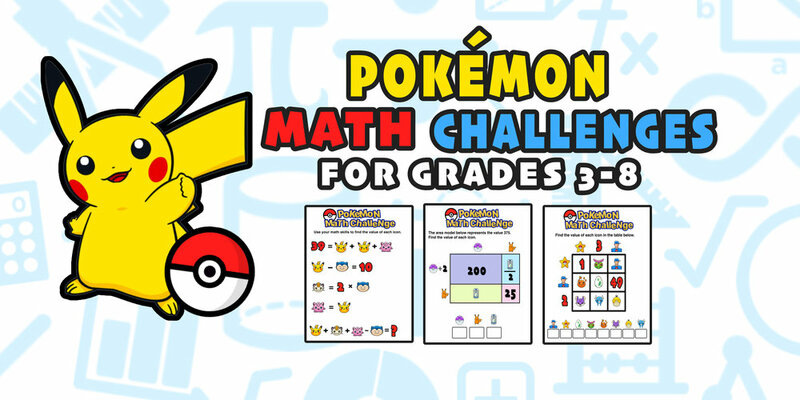 Are you ready to channel your kids' enthusiasm for Pokémon into learning math? 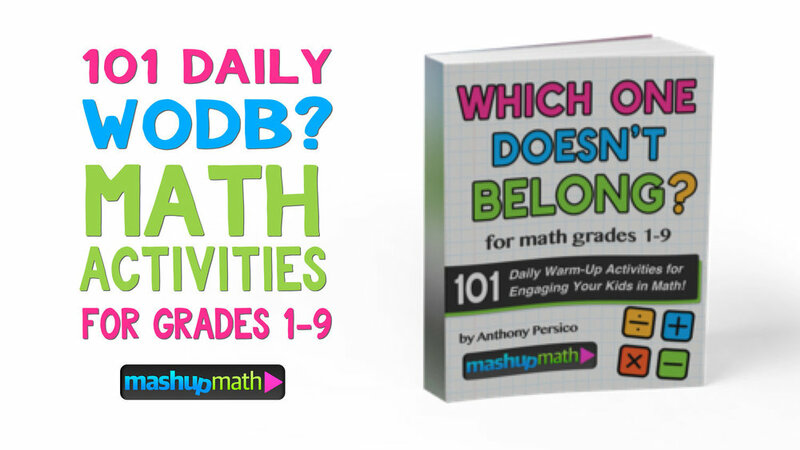 Math puzzles give your kids an opportunity to think critically and deeply about mathematics, develop problem-solving strategies, and work through challenging problems. 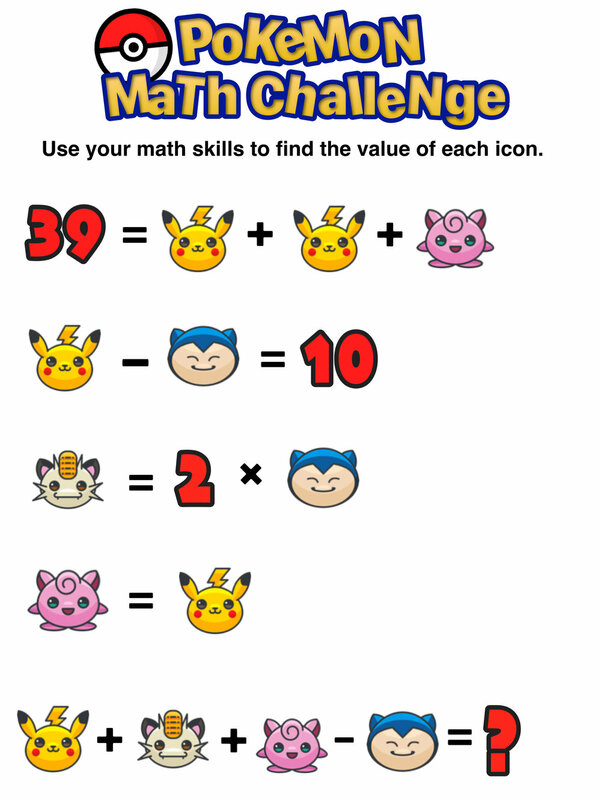 And when math problems incorporate your kids' personal interests (because who doesn't love Pokémon? ), their engagement will skyrocket! 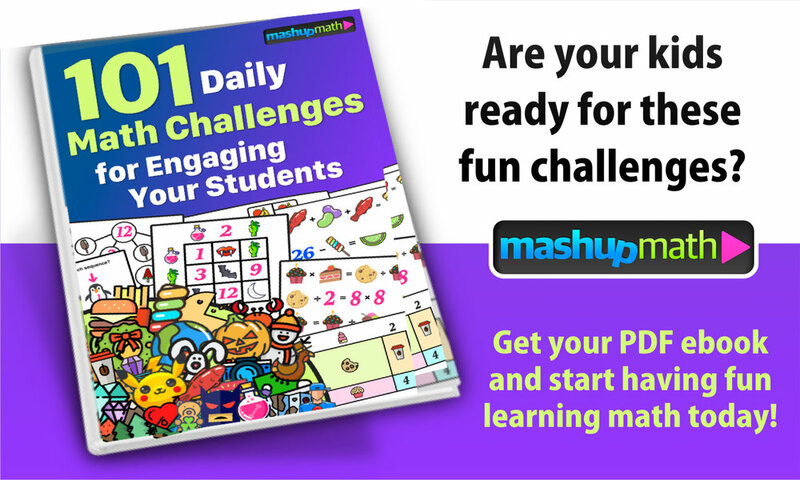 So, go ahead and try these challenges and puzzles with your kids this month. 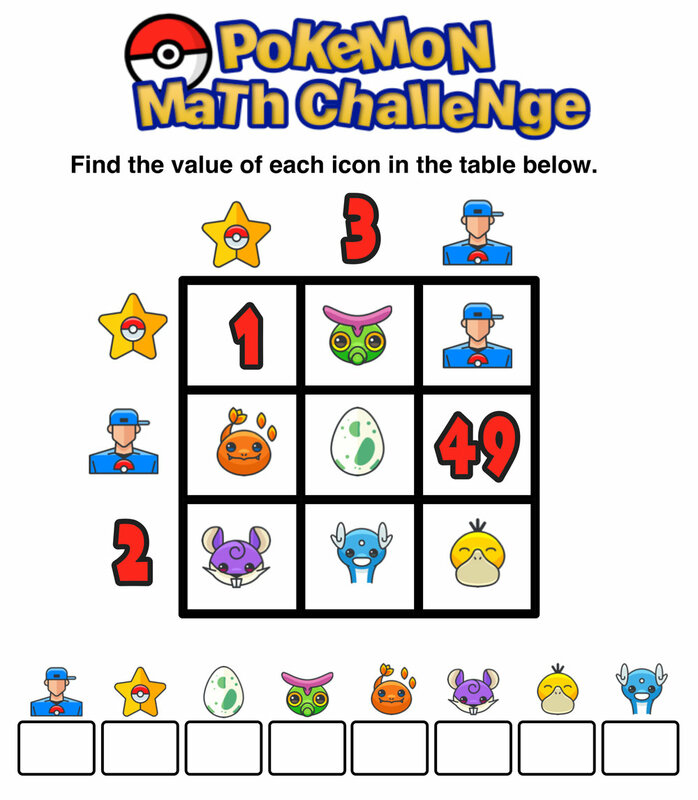 These free and printable Pokemon math activities are perfect for warm-up and/or cool-down activities and are great for sparking mathematical discussions in your home or classroom. The puzzles are perfect for students in grades 3 through 8. Hint: Since Pikachu and Jigglypuff are equal to each other, they are interchangable. Area models help kids to think visually about multiplication, which is the approach that Mathematical Mindsets author Jo Boaler recommends most for improving math understanding. 4.) Which One Doesn't Belong? Tip: Have your kids justify their thinking in writing! 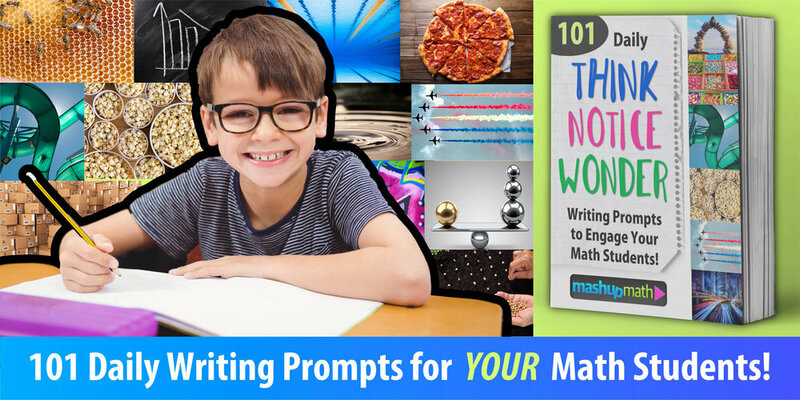 And Think/Notice/Wonder (TNW) writing activities are a great way to get your kids engaged in math writing every day. You may not know much about Pikachu or have a clue what a Jigglypuff is, but you can appreciate the iconic status of Pokémon and how immensely excited it can make your kids. And you're going to miss a perfect opportunity to channel that enthusiasm towards genuine learning opportunities. So, are you ready to elevate your teacher status to Legendary and empower your kids to become Pokémon masters? 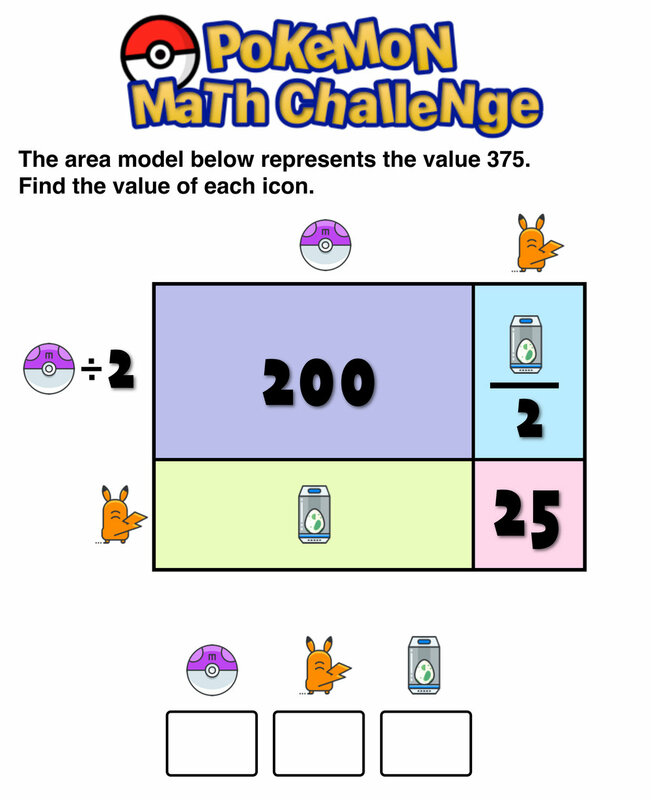 The following list of ideas, activities, and examples of how teachers can use Pokémon to teach math will get you started. These activities can be used as described or tweaked in any way you want to best meet the needs of your kids. A Pokémon master is willing to go out and explore her world to find and capture as many creatures as she can. Using the grid shown, you can have students navigate the coordinate plane in their quest to capture Pokémon. You can click here to download the PDF of the map! Try this: Have your students start at a PokeStop and have them try to find the optimal route to catch every Pokémon, given that you can only capture three at a time before returning to a PokeStop to get more Pokeballs. Elementary Application: Have your kids find the coordinates of each Pokémon. Middle School Application: Incorporate elements of area and perimeter. High School Application: Incorporate distance formula. Some Pokémon are rarer than others and the most powerful ones are in short supply and difficult to find. 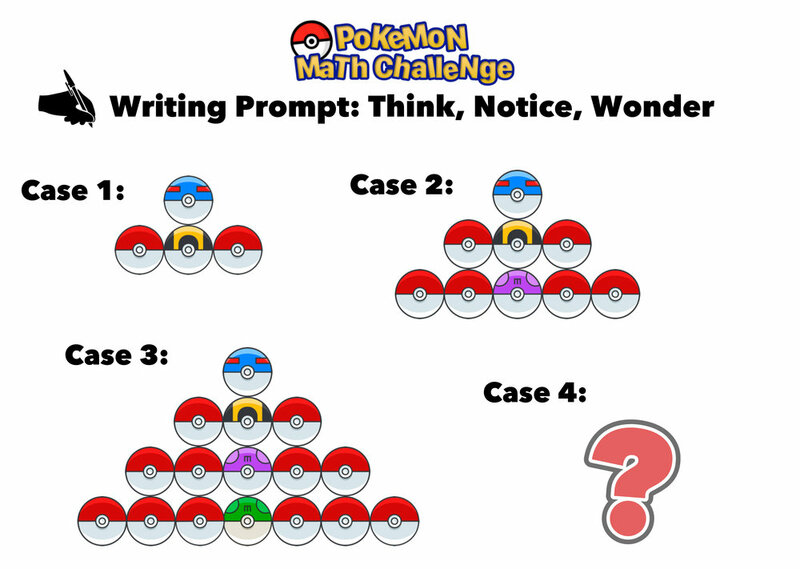 You can tie this idea into teaching probability by turning your classroom into an environment where Pokémon are hiding around every corner! Cut out and distribute the Pokémon icons on the chart all around your classroom, and let the hunt begin! You can click here to download the PDF! Give students a few minutes to search for them all and complete the corresponding tally chart. You can click here to download the Tally Chart PDF! Once your kids have collected their data, you can explore predicting outcomes (in this case, finding a particular Pokémon). Example Question: Based on your data, what are the chances it's a Pikachu? 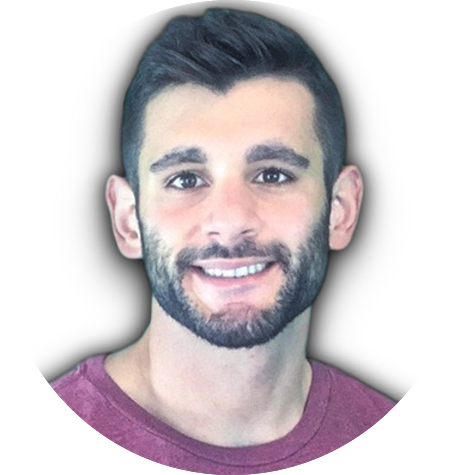 This idea comes from the blog post How To Use Pokémon Go In Your Math Class on tips4teachers.net. There are many ways to incorporate Pokémon into your ratios and proportions unit. You can also have students complete the tally chart from the last example and then explore the ratios between the frequencies of each Pokémon. Sample questions for exploring ratios using the tally chart activity. There are many ways to classify and categorize Pokémon. Some distinctions include their source of power (fire, water, electricity, etc. ), how they move around (flying, swimming, teleportation, etc. ), and individual abilities (fighting, defending, mind controlling, etc.). Using double, triple, and quadruple Venn Diagrams is a great way for kids to think about the different ways to classify Pokémon and identify similarities and differences. You can have students cut out icons for 20 different Pokémon and distribute them on a Venn Diagram using categories of their choosing. You can click here to download the PDF chart. Let students choose their own categories!